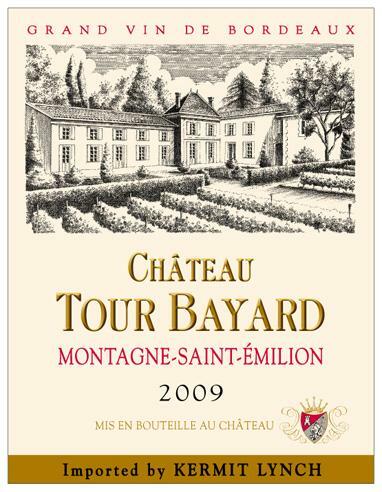 The Château Tour Bayard has only been in the family since 1956, but the Nicoletti-Richards have already demonstrated great skill in bringing out the best in the land. Current owners Fanny Nicoletti-Richard and Bruno Richard inherited the estate from Fanny's parents, who purchased the domaine, but several generations of the family had already worked as vignerons at other estates in the region, so the Nicolettis were masters of their trade by the time they arrived at the château. Unlike some of their fancier neighbors, these Right Bank vignerons get a little earth under their fingernails. The Richards also plant other crops in addition to their vines, but it is their Montagne St-Émilion that surprises us year after year with its firm, chewy tannins, plump fruit, and incredible value. Montagne St-Émilion is regarded as a "satellite appellation" of St-Émilion. While it shares much of St-Émilion's elegance and quality, the wines are a fraction of the price and the estates much less corporate than those in the neighboring hillside town. The Richards tend ten hectares of forty-year-old vines, deeply rooted in clay and limestone soils in a perfectly exposed natural amphitheater where they incorporate organic methods, shunning chemical pesticides in favor of natural composts which encourage microbiological activity in the soil. The Tour Bayard vineyards face south, yielding such ripeness that Kermit has been known to follow Bandol tastings with their wines. Merlot accounts for 70% of the blend, along with 25% Cabernet Franc (known regionally as Bouchet), and 5% Malbec. All vineyard parcels are hand picked and vinified separately. This terrifically bold Montagne St-Émilion is another amazing KLWM selection that is approachable enough to be enjoyed now and intense enough to age happily in your cellar for years to come. James Suckling 90"Mineral steely nose with some cranberry and red cherries. Opens up with a fresh delicate floral note. Sweet on the palate with a nice purity and focus. Delicate and quite light, but pretty. Tannins need time to soften. Try again in 2015."